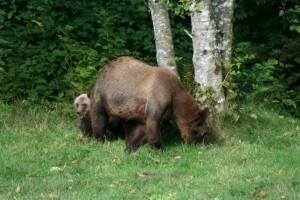 Spring and early summer bring the grizzly bear mothers to the shore of Knight Inlet to look for food. Eating either sedge grass that is common to all of BC coastal river estuary or turning over rocks to eat whatever moves. On the tours from the lodge it is common to see the first year cubs and their mothers. In this case a mother grizzly trying to get a bite to eat while the cub stays close. The spring cubs in the estuary do not stray far from mum. 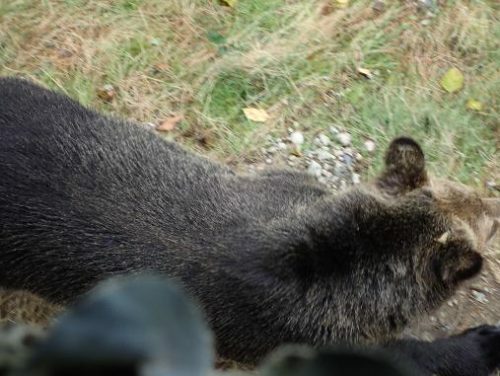 … However I did not reduce my zoom so missed part of the bear beneath the viewing platform. This grizzly was not concerned and never looked up as it was concentrating on the larger males fishing in the river about fifty meters (yards) away.